I haven’t done any baking in ages so last night I decided to make some cupcakes, out of the list of cake suggestions I gave I decided on Rolo Cupcakes. Test either by pressing the top of the cake gently – if it springs back then it’s done or push a cocktail stick or a skewer into the middle of the cake, if it’s clean when it comes out then it’s cooked or if it has bits of raw cake stuck to the skewer, probably not done! Once cooked, remove from the oven and leave on a wire rack to cool. I then added a few drops of vanilla essence. 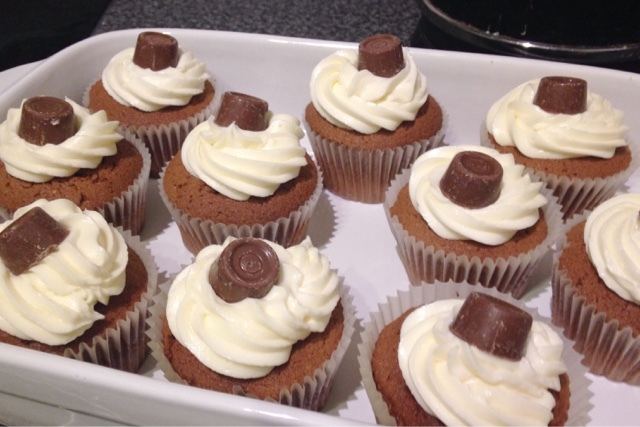 Tip – I use a piping bag for my icing. I fill my piping bag up and rest it in a big glass, put it in the fridge for later when the cakes have cooled and are ready to ice. You must wait until the cakes are 100% cool otherwise, the heat from them will melt the icing when you try and ice them. Sit back and feel like a domestic goddess. Voila! Rolo Cupcakes. Let me know if you make them! I chose Rolo cupcakes as a suggestion in the list for Pete to choose from after I saw Lauren’s recipe. great blog, definitely check it out.